The quantitative information provided by the pH measurement expresses the degree of the activity of an acid or base in terms of hydrogen ion activity. The pH value of a substance is directly related to the ratio of the hydrogen ion [H+] and the hydroxyl ion [OH-] concentrations. If the H+ concentration is greater than OH-, the material is acidic; i.e., the pH measurement is less than 7. If the OH- concentration is greater than H+, the material is basic, with a pH value greater than 7. If equal amounts of H+ and OH- ions are present, the material is neutral, with a pH of 7. Acids and bases have free hydrogen and hydroxyl ions, respectively. The relationship between hydrogen ions and hydroxyl ions in a given solution is constant for a given set of conditions, either one can be determined by knowing the other. 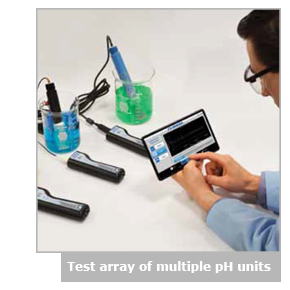 More accurate pH measurements are obtained with a electronic pH meter. A pH measurement system consists of three parts: a pH measuring electrode, a reference electrode, and a high input impedance meter. The pH electrode can be thought of as a battery, with a voltage that varies with the pH of the measured solution. The pH measuring electrode is a hydrogen ion sensitive glass bulb, with a millivolt output that varies with the changes in the relative hydrogen ion concentration inside and outside of the bulb. The reference electrode output does not vary with the activity of the hydrogen ion. The pH electrode has very high internal resistance, making the voltage change with pH difficult to measure. The input impedance of the pH meter and leakage resistances are therefore important factors. The pH meter is basically a high impedance amplifier that accurately measures the minute electrode voltages and displays the results directly in pH units on either an analog or digital display. In some cases, voltages can also be read for special applications or for use with ion-selective or Oxidation-Reduction Potential (ORP) electrodes. Buffers are solutions that have constant pH values and the ability to resist changes in that pH level. They are used to calibrate pH measurement systems (electrode and meter). There can be small differences between the output of one electrode and another, as well as changes in the output of electrodes over time. Therefore, the system must be periodically calibrated. Buffers are available with a wide range of pH values, and they come in both premixed liquid form or as convenient dry powder capsules. Most pH meters require calibration at several specific pH values. One calibration is usually performed near the isopotential point (the signal produced by an electrode at pH 7 is 0 mV at 25°C), and a second is typically performed at either pH 4 or pH 10. It is best to select a buffer as close as possible to the actual pH value of the sample to be measured. The temperature setting on the meter must correspond to the temperature of the buffers used, or an automatic temperature compensator must be employed. Turn pH meter to “pH” or “ATC” if automatic temperature compensation is used. Place clean electrode into fresh, room temperature pH 7.00 buffer. Adjust the pH reading to exactly 7.00 using the ZERO OFFSET,STANDARDIZED or SET knob. Place electrode into the second buffer, either pH 4.00 or pH 10.00. Adjust the pH reading to display the correct value using the SLOPE, CALIBRATE, or GAIN controls (coarse adjust). Adjust the pH reading to read the correct value using the SLOPE knob (fine adjust). Instrumentation is frequently the source of disturbance for pH systems, through repeatability error, measurement noise, or valve hysteresis. In-line pH loops will oscillate, regardless of controller modes and tuning, if setpoints are on the steep parts of the titration curves. pH electrode submersion assemblies with unencapsulated terminations below the liquid surface will eventually have wet terminations. Reagent control valves that are not close-coupled to the injection point on in-line systems will cause reagent delivery delays large enough to describe the tools of your trade n words that may seem foreign. You need either a flow meter or a seer to diagnose reagent delivery problems. Flow feedforward signals should be multiplied by pH controller outputs and employed to operate reagent valves directly or to establish reagent flow control setpoints. Transportation delays to pH electrodes in analyzer houses will exceed mixing deadlines - such that increasing comfort in checking the electrodes is offset by decreasing comfort in checking trend recordings. Injection electrodes should be preferred to sample holder assemblies whenever possible to reduce maintenance problems and improve response times - but not all injection electrodes are created equal. Large tanks are fine if you don't have to control them; use the volume upstream to reduce reagent consumption or downstream to reduce control error. If you can't make-up your mind where to use one, put it downstream. 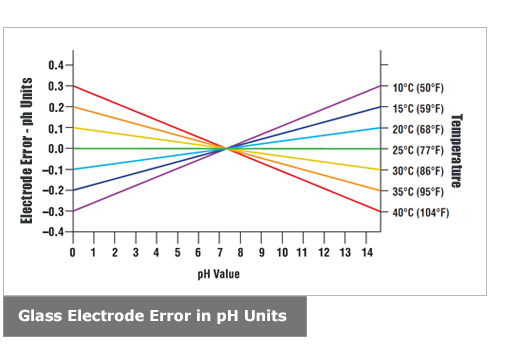 Install one or three but never two electrodes for a pH measurement.